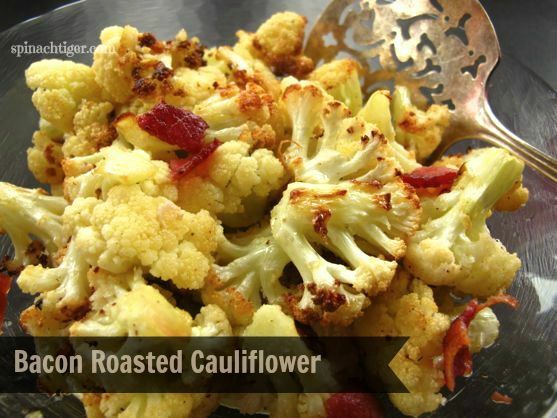 Home » Healthy Recipes » Bacon Roasted Cauliflower. Today in the parking lot of Trader Joe’s a woman drove up to me and stopped her car to tell me something. She rolled down her window and said, “you have beautiful hair, everything about it, even the color.”I was in shock. That’s never happened to me in my life, and it happened after I had already written this post. If you read further along you will know just how much a hair compliment means to me, even if I pay for the color. When I was seven years old, my mother had my hair cut into one of those pixie cuts. I didn’t have her stick straight hair which may have worked with this cut. I had more of my father’s coarse, curly hair, which shrinks up even shorter after it dries, and becomes wiry and anything but pixie-like. In the eyes of a seven year old girl who already felt like a big misfit, Cruella Scissorhands transformed my long, pretty waves into a Brillo pad adding further angst to my awkward grade school years. To make it worse, my grandmother was a hair stylist who decide a year later to give me a permanent. Perming short, wiry hair is like adding a tsunami to the 40 day flood. Little did I know I would grow up to have the hair that most women can only get if they purchase hair extensions. I have natural super model hair, if and only if, someone knows how to style it. When cut short or blown dry in the wrong way, my super model mane becomes a wiry mess guaranteed to go horizontal and take a life of its own, because without length to weigh it down, it shrinks up, and looks like it’s ready to scrub your pans. I don’t what my mother was thinking because there was never anything pixie about me. I was the tallest girl in the class and the second tallest of anyone. I hated being tall, I hated second grade and I really hated my hair, believing it put me at a disadvantage. I learned early in life that Teachers never like the tall girl with very bad hair. All women have bad hair days, but I had bad hair years, and I grew up to believe nothing could be done, until I grew it out quite by accident in the sixth grade. It was the first year of my life that I excelled in school and that the teacher liked me. I mean really liked me. Miss Lowe was her name and she told me I was pretty, which initially made me suspicious of her. Prior to age 11, during my bad hair years, no one out side of blood relatives had ever called me pretty. I am convinced to this day that if only someone had fixed my hair properly, my second, third and forth grade years would have been different, and I wouldn’t have been the girl who was always kept indoors writing out times tables during recess. Our teachers always selected a little spy who would stand in the class when the teacher left the room with pencil and paper to take down names of anyone who talked. My name was always on that paper, and you can bet the little rat fink was always petite and had nice hair. And, not only did Ms. Lowe tell me I was pretty, she told me I was smart, and she let me teach the class some math, because my bad hair guaranteed mastery in the times tables and a comfort with numbers. What in the world does this have to do with bacon roasted cauliflower? In the vegetable world, cauliflower has the same fate as a girl with bad hair. At first site, it’s not a very pretty vegetable. While I have made purple cauliflower here, it’s usually white and can even look rubbery. When boiled, it’s fairly tasteless and all too often served with some orange cheese sauce. Yuck. Cauliflower is a wonderful treat, however, when one understands its texture and its potential. To totally transform cauliflower into something that is a more star quality food, all one need do is roast is. There are so many possibilities for adding flavor, and today I chose bacon. I’m not a bacon groupie, but a piece of bacon cut up and roasted along with a head of cauliflower goes a long long way. Simply break the cauliflower up, toss with a little bit of oil, salt, pepper and a slice of bacon that has been cut up. It will cook right along with the cauliflower and render fat and flavor. Bacon roasted cauliflower is one way to give a little super model treatment. Roasted Cauliflower with bacon delivers delicious texture and flavor. Trim Cauliflower and break or cut into small pieces. Cut bacon into 2 inch pieces and arrange over the cauliflower. Bake for approximately 15-12 minutes, tossing halfway through. Oh what I wouldn’t give for hair like yours…. Great story and I love what you did to that cauliflower. Great story. Love the recipe…I love ramdom compliments myself…The best is now when you walk into a bar they ask for your ID….LOL…made me feel good until I found out they do it to everyone…. Aaah!…Hair! Sometimes I miss it! LOL! Great story Angela…as for the cauliflower, I must say I have never roasted it before. Must try…especially with bacon…mmm! I am rather crazy about cauliflower and recently tested a recipe for Relish Magazine using cauliflower as the main ingredient in a pasta sauce. It was incredibly delicious and a great use of this often misunderstood vegetable! Your recipe sounds equally delicious and I cannot wait to try it. Love your story, Angela, and the recipe sounds delicious! What a fun analogy! I loved the story. I’m not a bacon groupie either, but I keep a bag of crumbled bacon in the freezer (it’s lower fat and calories) and a spoonful goes a long way in lots of dishes to add a little smokiness and salt. i have naturally tightly spiraled curly hair + my mom made the grave mistake of cutting it super short all through elementary school, too. pretty much all of my elementary/middle school years were a hair disaster! luckily, i discovered the wonderful world of hair products, a diffuser + a blowdryer in high school, which changed my hair life forever. coincidentally, that’s about when i started liking cauliflower, too. great recipe, + great story! When I come from the hairdressers my hair looks adorable. I need to pop my stylist into my pocket and take her home. As for cauliflower I am trying to adore it too. This recipe may win me over. Well…I love cauliflower and have never thought of it as unattractive! And I have always wanted curly hair. I thought being born with dead-straight fine hair was a curse. Great story! I is always nice to get complimented by random strangers… I had very straight hair as a kid and as a teen it started getting incredibly frizzy. Now, it’s just curly, but I miss my crazy hair.